The Ghanaian electrical power supply system relies for the major proportion of its supply capacity, on the Akosombo hydro electric scheme in the eastern region of the country. Unseasonal droughts in 1997 and 1998 coupled with a dramatic increase in demand resulted in serious shortfalls in electrical power availability in 1998. All utility supplied electrical energy users were required to significantly reduce their consumption for an extended period. Lord Consulting Engineers were commissioned by three separate, existing gold mining companies to identify and implement solutions to permit these operations to continue in production in spite of the electrical power supply deficit. In each case the solution was similar, although implementation details varied across the sites. 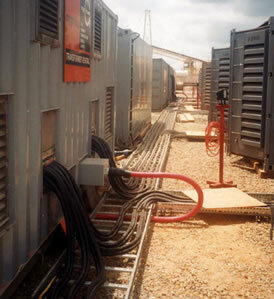 Base load plants, sized appropriately to the operations' energy needs were established at each site using fast track, rental, containerised, diesel powered, parallel configured generator sets connected into the sites' electrical distribution systems. In some instances, connections were made at MV, in others, at LV. In all cases additional switchgear and cabling had to be provided and connected into existing systems. Appropriate protection for parallel operation with the utility had to be provided. Installation layout details and configurations had to be determined.